Drop In Art Days! – Select Wednesday’s this summer! Come create with A4A & SOS this summer! Drop in to these art days from 10 AM – 12 PM and experiment with all kinds of art and craft projects, including alternative murals, painting, drawing, weaving, and more. There will be two options available at every drop-in day, and students in grades K-12 are welcome to join. Spots are limited, so pre-registration is appreciated. $10 per student per day, or take advantage of the Summer of Art deal and attend all 5 workshops for only $40 per student. Registration is REQUIRED and parent permission required for all minors, either online, or in person upon arrival. 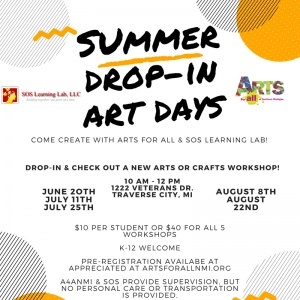 Register for Summer Drop In Art Days! A4A provides volunteer supervision, but cannot provide personal care or transportation. Arts for All of Northern MI provides accessible arts and culture opportunities to engage, empower, and inspire individuals with disabilities, and their peers, in the 5 county region. Check us out on social media for more info! SOS Learning Lab – We facilitate learning for people of all ages and abilities, focusing on skills,organization, and strategies to achieve success in school, at work, and in life. We also specialize in the unique needs of people with Traumatic Brain Injury, Learning Disabilities, Dyslexia, ADD and ADHD, Emotional Impairment, and Cognitive Impairment. Visit http://www.soslearninglab.com/ for more information!